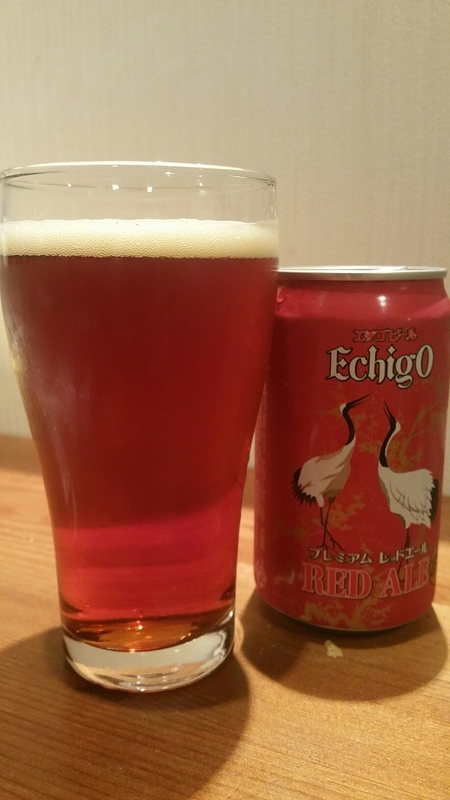 Echigo Premium Red Ale is a 5.5% amber ale from Echigo Beer Company, based in Yuzawa city, Niigata. Without focussing too much on the trigger word for Joe’s sake, this beer is part of their all-year round range and has become increasingly common across Japan over the last few years. It has an IBU of 25 units; however, the hops used in the beer are unknown at the time of writing. Echigo Premium Red Ale can be found in cans, bottles, and also on draft form as well. One of the first craft beers I had in Japan back in 2004 makes an appearance. Echigo Premium Red Ale was one of the first Japanese craft beers I had back in 2004 on a snowboarding trip to Echigo Yuzawa that ended being covered in snow and trying to hunt beer. This popped up in the old station in Kokoro land where we tried to avoid the sake vending machine and get some beer. Since then, it’s become increasingly common across Japan, along with Yo-Ho Brewing’s range of beers. It poured out a deep amber colour with some hints of brown and particulates in the body too. The head was meagre, less than a finger’s worth and had a slight amber hue to it as well. The aroma coming off of it was more sweet than hoppy, with caramel being the most noted aroma though some citrus and pine notes were also present. The body also lent more towards the sweet aspect with caramel and toffee being the strongest flavours. However, there were some detected hop notes of citrus and pine again though they were faint and faded as Echigo Premium Red Ale warmed up. The body was a a bit too watery for my liking as well. The aftertaste tried to bring some of the bitterness but ended up feeling a tad sweet and sticky. Echigo Premium Red Ale is a nice introduction to ambers but there are better ones out there.